or Joan Barreda, who ground to a halt on the route to Tucuman. After having overtaken “Chaleco” Lopez then Juan Pedrero, the winner of yesterday's stage, the KTM leader re-asserted his status by putting an impressive distance between himself and his pursuers. On completion of the first part of the special stage, a 211-km long section, the comeback king, who had to miss out on the Dakar 2013 due to an injured shoulder, avoided the many traps into which fell Paulo Gonçalves (who dropped out after his bike caught fire) or Cyril Despres (overheated engine, navigation errors, etc.). Since cohesion is a sacred concept for the Catalans, it was natural that his closest pursuer was none other than his water carrier, Jordi Viladoms, 13 minutes behind. A gap was opened on Despres, who finished 45 minutes later; on Barreda and Pain, who lost out in similar proportions; and on Lopez, who trailed in more than 50 minutes after. Read More. 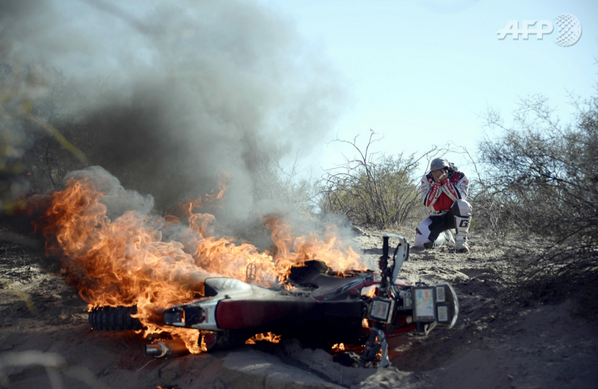 This is proving to be a rough Dakar. Annie Seels and her buggy (I know, right?!) partner Garry Connell were out of the rally yesterday while Pal Anders Ullevaseter had to leave the race on Stage 2, I think it was. Seel's first withdrawal from the race, ever. View the complete list of Dakar 2014 withdrawals. Watch the Dakar 2014 Stage 5 Video. My First Post on Dakar 2014.